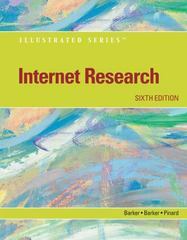 Internet Research Illustrated 6 Edition Equip your students with Internet Research knowledge using this practical user-friendly book from the Illustrated Series. New edition features vastly expanded coverage of social media search, with an entire unit now dedicated to the topic. Explores how to use social media meta search engines to find information from multiple social media sites simultaneously. Additional emphasis on evaluating the value, veracity, and reliability of content found online. Continued attention to Boolean search and the use of other advanced search operators to maximize the efficacy of Internet research. Streamlined coverage of specialty searches and the use of subject directories, using state-of-the-art search techniques.